Margazhi Tiruvadhirai in December-January and Mahasivarathri in February-March. Lord Shiva is a Swayambumurthy. Sri Eyilinathar Temple, Paramathi Velur Nansei Idayaru – 637 207, Namakkal district. The shrines of Lord Vinayaka, Lord Muruga accompanied by His consorts Valli and Deivanai, Dakshinamurthy, Chandikeswara, Saneeswarar-Saturn, Bhairava, Nalvar-four saivite saints Gnanasambandar, Tirunavukkarasar, Sundarar and Manickavasagar-and Nandhideva are in the corridor-prakara of the temple. The wedding hall in the temple is offered free of cost to the people of the place to conduct their family marriages. People pray for removal of obstacles in marriage alliances, child boon, and progress in education. Devotees perform abishek and offer vastras to Lord and Mother. Swayambulinga is one that exists of Itself. There are some places which God had chosen Himself. There are five such holy places with Swayambulings in Salem and Namakkal districts. Paramathi Velur Nan Sei Idayaru Eyilinathar temple is one among the five important temples in the region. Nan Sei Idayaru is a fertile land situated between Cauvery and its tributary Manimutharu. The place is named after the fertility beauty of the place. The place has many temples big and small. 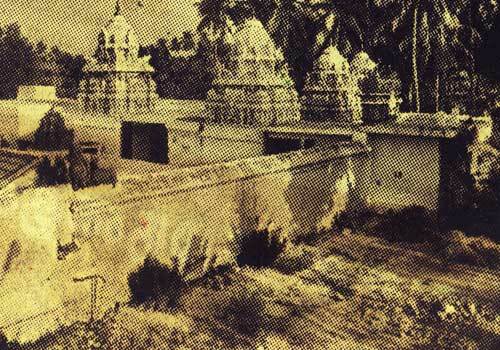 Sri Srinivasa Perumal temple is within the compound wall of this temple. Worshipping all the five places simultaneously would bring in great benefits to the devotee. According to epigraphic details, the temple was built by Rajaraja Cholan and his son Rajendra Cholan. The temple was built in the 10th century. Nan Sei Idayaru has also the Shivalinga installed by Beema of the Pancha Pandava brothers known for his prowess. Though good in nature, he had the pride that he was the strongest and could not be conquered. This thought told upon his fame. Lord Vishnu wanted to teach him humility through Lord Shiva who created a Purushamirugam (a creature with human body and animal head). Beema was not able to stand before its power. He began to run away screaming Govinda, Gopala for safety. He escaped from this creature by the grace of Lord Shiva. He performed pujas at five places on the banks of Manimutharu springing from the Servarayan hills. Salem Sukavaneswarar, Uthamachozhapuram Karapuranathar, Pillur Veeratteswarar, Paramathi Beemeswarar and Nan Sei Idayaru Eyilinathar temples are these five worshipped by Beema. Miracle Based: Lord Shiva is a Swayambumurthy in this temple. Place: Nan Sei Idayaru is 3 km east of Paramathi Velur in Namakkal district.